Reading this? 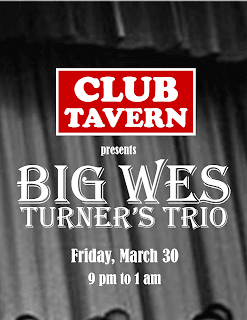 Then you’re in touch with Big Wes Turner’s Trio. Big Wes himself is not so easy to click on, call up, or pin down. You won’t find him on “social media.” The man doesn’t own a computer. Never has. And cell phones? “Ain’t those just itty bitty computers?” He’s never owned one of those, either. Although he has been known to eagerly share photos of friends and family, the Big Man is one of those folks who seem to have talent for evading cameras. Evidence of his presence remains rare, but at ease or in action, Big Wes gets around. He’s traveled the world, and for all the miles he’s logged up and down the backroads of the Midwest, he could easily have circumnavigated the big ball a few more times. A lot of people have seen him here or there, and a lot more say they’ve seen him, but seen or unseen, when you hear some sweet pickin’ on a guitar that sounds like it’s been down the road for more miles than most can imagine, well... rest assured that you’re on the same wavelength as Big Wes. Set your worries aside and hum along. Lucky you! (Get it?) Big Wes Turner’s Trio is back and boppin’ the Blues, appropriately at The Blu Room at Breezer’s Pub in Dubuque, Iowa. P.S. Big Wes Turner’s Newsletter has added an amazing new option: POSTCARDS! Whaaaaa? Yeah, you heard right. Most well-informed Turnerites receive their sporadic action updates via email, but now they can alternately (or additionally) get a scrap of cheap cardboard with information scribbled thereupon... FOR FREE!!! Just ask us.